Noting that he has helped to put in and take out governments, Shabazz said he feels strongly that much more can and should have been done for the Fifth District. "I am running a very awkward campaign because I have supported Ms Christopher (Hon Delores Christopher) for many years and I have a lot of love and respect for her, and I am not out here condemning and criticising her. But I know for a fact that there are many vital things that should be addressed in the district and I am not in favour of encouraging people to go to the polls, or going to the polls myself, and elect representatives that fail," said Shabazz. Indeed known to be an ardent supporter of the Honourable Delores Christopher, Shabazz sought to make it abundantly clear that he has no beef with Hon Christopher neither would he be critical of her as they are and will continue to be very close friends. He said, 'I am serious about this elections and I am asking you for a chance to contribute." "Now you might do a few things but you have to get a passing grade. You cannot send that trend to the young people, you must be productive." He said he came from a vocational background where when you ask someone to do the job and they are not doing it you have to take the tools and do it yourself. 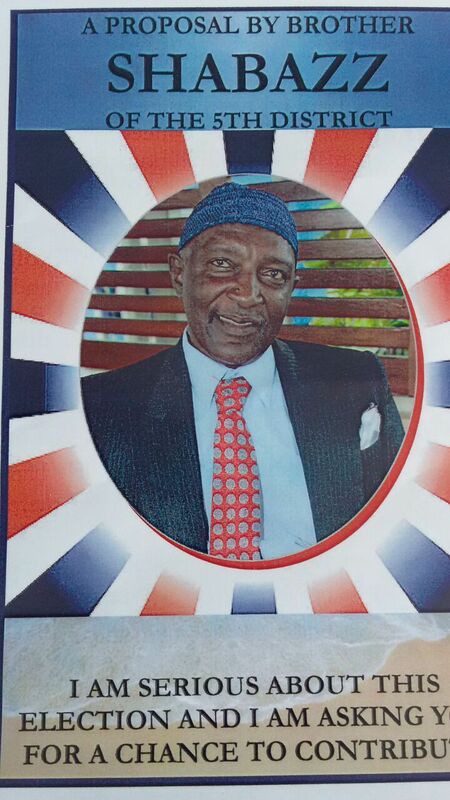 In outlining some of the reasons why persons of the Fifth District should vote for him, Bro Shabazz said he can be relied upon as having the interest of the people at heart and he has proven so over time, noting that in 1990 he donated very large portions of lands owned by him and proposed the widening of the Great Mountain Road. In addition, in 2005 he was the one that spearheaded the cleaning of the Great Mountain "spring" that had been abandoned to a mere dump site. 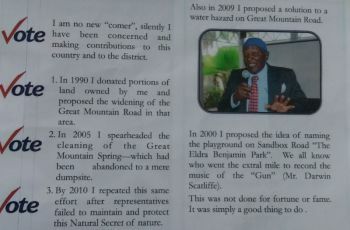 ‎Further, he said in 2010 he repeated the same effort after representatives “failed to maintain and protect the natural secret of nature”. 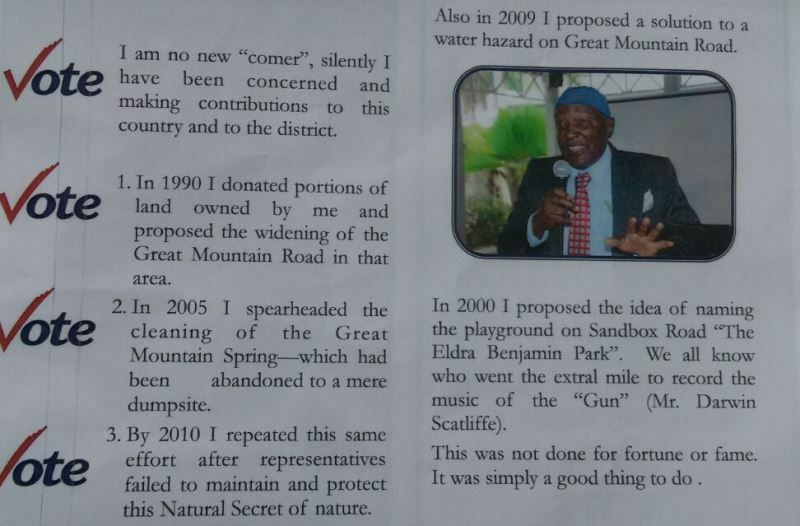 Further attesting to his genuine desire to help build the territory, Shabazz said that in 2009 he was the one that proposed a solution to the water hazard on Great Mountain Road and in 2000 he proposed the naming of the playground on Sandbox Road ‘The Eldra Benjamin Park’. "We all know who went the extra mile to record the music of the ‘Gun’ - Mr Darwin Scatliffe. This was not done for fortune or fame. It was simply a good thing to do," he said. Asked about the challenges currently facing the district, Mr Shabazz directed this news site to his promotional flyer where he highlighted the issue of “loose livestock” continuing to plague the district and "undivided property" in the district that requires intervention. He spoke of the need for a transparent District Committee that is constantly moving forward with the affairs of the people. "I tried... I can't get any satisfaction," said Bro Shabazz. Also contesting for the Fifth District seat is Virgin Islands Party candidate Zoe J. Walcott-McMillan. Every body has rights--everyone has limits also. Shabazz I got your back. Sounds like a plan for the district. Best of luck! Stop it now man. This isn't a joke anymore. Who next to get in the ring buddy? 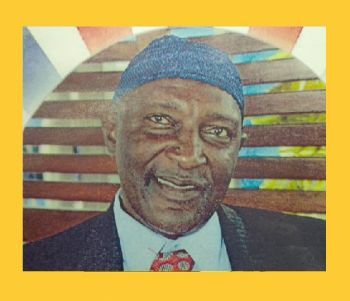 Bro Shabazz, i will vote for you, i love your smoothie and i know if you win it will be free smoothie for the entire day, so please, calling all smoothie lover give bro shabazz your x because that is the only opportunity you have to get a free smoothie in the bvi. Seriously? this is his platform for election? his qualifications? seriously? Is this a calypso show??? The 4 votes that he is going to get Delores will need them. It is pure crazy people running in the 5th? Where is the Dawson lady? Shabazz please stop fooling the people and tell them NDP put you in dey to take votes from Zoe.. true that, be real people no fooling around …NDP must go! HE AND CHRISTOPER THINK PEOPLE IN THE 5 ARE FOOL HE AND HER ON THE SAME PARTY THE NDP PUT HIM THERE TO TAKE VOTE HE RUN BEFORE AND GET 4 VOTE I GUESS THE NDP HAVE THOUSAND DOLLAR TO GIVE HIM TO RUN HE WOULD NOT GET THE HALF BACK I GUESS THEY HAVE MONEY AND SAYING THE COUNRTY HAVE NOT MONEY. If you win this district the plan Mosque at Horse Path will finally be approved.